A first year medical student, whose been obsessed with death since the loss of her sister, convinces her peers to kill her. The five students take turns killing each other for minutes at a time before reviving one another in order to study brain activity that may just be the link to the afterlife. Scientific exploration turns into a deadly obsession. They may have figured out how to defy death but what dark forces have they brought back with them from the other side? 2017’s version of Flatliners isn’t a sequel to its 1990 predecessor. It also isn’t exactly a remake, using completely new characters with the same concept and title. The scares are less psychological and more traditional horror jump scares. Things moving on their own and dead things popping up behind people isn’t exactly breaking new ground. The newest vision is brought out of the 90's, dark dungeon setting and brought into the bright hospital medical lights, becoming a more realistic movie for it. Flatliners isn’t a bad horror redux but does lack heavily in originality. It has good characters but they aren’t explored enough to form much of a connection. It focuses too much on its destination without enjoying the journey getting there. Its scares are too commonplace in horror movies today to be effective. I thought the biggest challenge for a Flatliners remake would be the cast. The original film starred a cast full of about to be break out stars. Luckily the latest cast is its saving grace. Ellen Page especially excels in a realistically obsessed performance. What can I say, she plays a dead girl well. Diego Luna and Kiersey Clemons are equally intriguing characters that don’t get explored deeply enough. Nin Dobrev gives one of her most vulnerable performances to date while Englishman James Norton comes off looking like a Kennedy in my first introduction to him. Kiefer Sutherland returns in a different role, playing a House like doctor. He holds his own against Hugh Laurie, proving once again that he’s an underutilized Hollywood gem. Unfortunately the performances are largely lost on a story that moves too quickly for the viewer to become attached. If you’re a big fan of the original Flatliners, you’ll probably be disappointed in its remake. 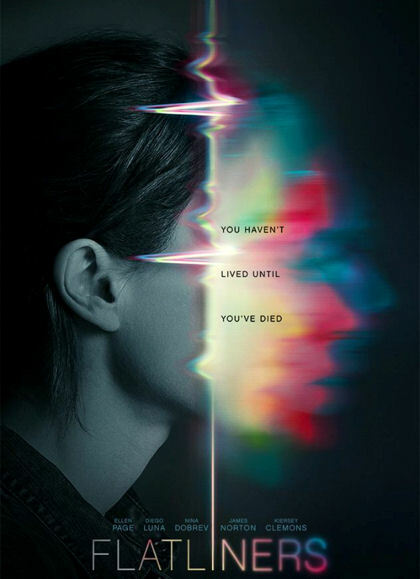 For casual fans and the younger generation whose never heard of it, this Flatliners doesn’t completely flatline on the big screen. We’re given an enjoyable but unoriginal film that has far more potential than it meets success.